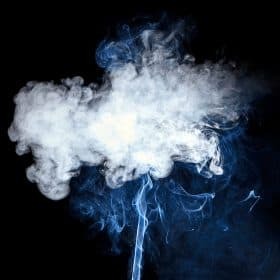 There’s a commonly used chemical that is well-known for its harmful effects on the human body. Despite its bad reputation, its use continues to be widespread. As if all the known harm caused by this substance were not enough, now a brand-new German study reveals another unexpected side effect that can weaken your bones. There is so much research showing the harmful effects of BPA that it’s hard to know where to start. From BPA in dental fillings causing “impaired psychosocial function in children”1 to the recent ban on the use of BPA in baby bottles and sippy cups,2 the toxic nature of this chemical is well-known and generally accepted by the public. The just published German study we’re going to take a look at today refers to a newly discovered toxic effect of BPA. According to one of the study researchers Dr. Dieter Swandulla from the Institute of Physiology II at the University of Bonn, “This substance has been shown to affect the hormonal system and may have negative effects on the function of enzymes and carrier proteins… It seems that fetuses and newborns are particularly sensitive to BPA,”3 he said. In fact, BPA is so notoriously toxic that scientists attempted to come up with a safer alternative. (More on that later.) Now, let’s look at what BPA’s toxicity means for your bones. New Bone-Weakening Effect of BPA: It’s a Calcium Blocker! Calcium signals cells to act or refrain from acting in a certain way. For example, calcium “tells” blood vessels and muscle cells to contract or relax. This cellular communication is crucial for many body systems, including (and especially) bone remodeling. Think about it – when your bones experience healthful stress, such as the kind you exert on them when you engage in weight-bearing exercise, osteocytes in your bones must “sense” this strain and communicate it to the appropriate effector cells, such as bone-building osteoblasts. Calcium acts as a mediator in this process, going between various bone cells and signaling them to build or tear down. The University of Bonn study, which was done on both mouse and human cells, found clear evidence that BPA blocks these calcium channels.4 It acts like a lock, shutting out vital calcium and breaking cellular communication. The study also mentions that drugs used to treat high blood pressure, cardiac arrhythmia, and other symptoms have the same calcium-blocking effect as BPA (hence their name, calcium channel blockers or calcium antagonists). Fortunately, the researchers discovered that the calcium-blocking effects of BPA are reversible. In addition, research at the Indiana University School of Medicine shows that medication-induced calcium blockage “did not completely abolish load-induced bone formation.”5 In other words, the effect of calcium channel blocking medication on calcium intake is temporary and incomplete. But therapy is typically long-term, so for those who are taking these drugs, calcium intake is interrupted and not fully functional. If you’re taking calcium channel blocking medications and you’d like to look into natural alternatives, discuss this with your health practitioner before stopping the drug. More often than not, small, easy changes to your lifestyle and diet can make a big difference, such as keeping a healthy weight, exercising regularly, and eating plenty of fresh fruits and vegetables. The good news is that if you’re following the Osteoporosis Reversal Program, you’re already implementing all these beneficial actions! Since BPA is so obviously toxic, and specifically does harm to bones, why is it still around? Interestingly, because the toxic nature of BPA is obvious, scientists attempted to come up with a safer alternative. Bisphenol S was created to be a “safer” substitute for BPA. It’s popping up everywhere, too, and its status as a healthier alternative is questionable. It’s even on various kinds of paper, including cash register receipts. In a 2012 study,6 cash register receipts, money, and recycled paper were shown to be coated with BPS. Researchers are concerned that people are absorbing significantly more BPS through their skin than they did when BPA was used. People who routinely handle receipt paper and currency are at the greatest risk for BPS absorption. Is BPS a Safer Alternative to BPA? It sure doesn’t look like it. A recent study from the University of Texas6 indicates that BPS mimics estrogen in much the same way as BPA. Researchers found that when rats’ cells were exposed to BPS levels comparable to what humans would experience in normal everyday exposure, the cells were unable to respond properly to natural estrogen. In other words, it caused a disruption in hormonal response and balance, just like BPA. So we’re bombarded on all sides by BPA- and BPS-containing products which can impair bone function. Earlier, we looked at various items that tend to contain BPA. In addition to finding BPA-free substitutes for those items, there are other ways to avoid BPA exposure. Here are some ideas. Plastic #7 – on the bottom of plastic containers, you’ll see a recycling triangle. In the middle, there’s usually a number. If the number is 7, then it’s polycarbonate, and can leach BPA into the food or liquid inside of it. No. 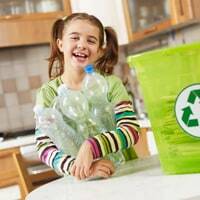 7 plastics are often used to make 5-gallon water containers, baby bottles, sports drink bottles, children’s ‘sippy-cups’ and many plastic utensils. Do not heat food or drink in plastic, especially if you are not sure if it the container has BPA or not. Heating causes much more BPA to be released. This includes washing plastic containers with hot water. Use glass food storage containers. Choose baby bottles, sippy cups, and other baby and child products that are made from glass, or non-polycarbonate plastic. Try to not touch cash register receipts unless absolutely necessary. 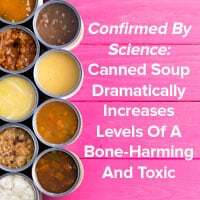 Unfortunately, it might be impossible to avoid all BPA, so in view of the new study which confirms that BPA blocks calcium channels, it’s crucial to make sure you’re eating plenty of calcium-rich Foundation Foods listed in the Osteoporosis Reversal Program. Also, it’s important to take the right calcium supplement, one that is “bioavailable,” or easily absorbed by the body. A calcium supplement that “plugs in” to those cellular channels and does its signaling job is ideal. What Kind of Calcium Supplement is Best? There are several key things to look for in a good calcium supplement. The presence of other Foundation Supplements is crucial. Vitamins and minerals work together, so a good calcium supplement should have as many of the Foundation Supplements as possible. An organic source is also important. Calcium derived from rocks, eggshells (eggshells contain 95% inorganic calcium carbonate), or other inorganic materials is not nearly as well absorbed as plant-derived calcium and can have undesirable side effects, including a greater risk of heart attack. Bone-healthy ingredients, such as extracts of herbs and/or foods that are known to boost bone health, are also a sign of a superior calcium supplement. TrueOsteo contains several Foundation Supplements and trace minerals, and it also has extracts of Amla fruit and cilantro leaf. In addition, TrueOsteo contains Ashwagandha, an herb that’s been shown to reduce cortisol levels in the body, thereby protecting your bones from this stress hormone. TrueOsteo offers a year-long, full refund if you are not satisfied; simply return the remaining bottles at any time over the next year. And TrueOsteo also offers a 20% off coupon exclusively available to the Save Our Bones community. Just enter SAVEOURBONES at checkout to receive your 20% discount. Please note that TrueOsteo only ships to the U.S., Canada, UK, Ireland, Australia and New Zealand. So if you live elsewhere, I apologize for the inconvenience. 3 University of Bonn. “Bisphenol A: BPA additive blocks cell function.” ScienceDaily, 6 Dec. 2012. Web. 2 Feb. 2013.
this is the first time your article disappoints: it’s tacky for you NOT to name the ingredients that are important re bpa/bps…you usually do. even tackier and actually sleazy is recommending a supplement with a coupon at the end! Like another one of your readers I handle money and cash register receipts daily at my job working as a salesperson at a boutique…what do you suggest we do if this is our livelihood or, as another reader mentioned, we are handed receipts from so many sources on a daily basis? Does it help to wash hands after handling? Is there a hand sanitizer we can use or is soap and water the way to go? I found this article very disconcerting as I have been trying to do everything else you recommend – diet, exercise and vitamin supplements…and now to hear that touching certain papers is so harmful…I feel like quitting my job! Please advise Vivian…am freaking out! I MEANT TO SAY MICROCRISTALLINE hydroxyapatite…. I am having contant severe pain in my mid back. Can you please recommend something that would help me so that I would not have to rely on Advil for some relief? It feels like it might be another fracture. I do not want to keep having x-rays to find out. I found that Heal-n-Soothe did help somewhat but am out of it now and don’t like to pay for the shipping to Canada. Helen, I am so sorry you’re dealing with that kind of pain! However, it could be caused by any number of things, and I am not a doctor so I can’t advise you in this regard. I hope you can see a trusted physician soon. I wish you a full recovery and a pain-free back! Dear Vivian, What do you think of ezorb calcium? Do you know anything about Bone Restore, Bone strength. I get it from Life Extension.I have your book Save our bones. Please let me know what you think of these two calcium. Yes I had heard about till receipts containing BPA – I work in in a shop so have been handing them for 20 years – so Im a gonna! I will try and wear gloves as of now – I suppose it gives customers a good excuse to shop lift!!! I’d Love To Be Able To Take “TrueOsteo”, But It Contains An Ingredient That Is Deadly To Me (Cilantro)! Cilantro Closes My Throat Up, And Causes Severe Pain In My Throat And Chest. I’m Also Allergic To Coriander, Tarragon, And Curry, And Possibly Ginger. The Last Two Are The Spices They Use In Japanese Soups And Their Japanese Salad Dressings! It’s Either Both Of Them Together, Or Just One Of Them. But I’m Not Sure, But They/It Will Close My Throat And Cause Severe Pain In My Throat And Chest Also! What Can I Do? Can They Make It Without Cilantro, And Any Of Those Other Spices/Herbs That Might Be In Them? Please Let Me Know! It’s VERY IMPORTANT TO ME! And I THANK YOU VERY MUCH FOR ALL YOU DO! THANKS!!! BOOK IS GOOD. INFORMATION WONDERFUL!!! True Osteo shipping fee is over exagerated. For one bottle of $40, an extra $27 is added for shipping in Canada, and this is in US funds. number to make sure everything. I take “TrueOsteo” calcium 4 capsules per day, thanks. I appreciate your research and all you have done to help. But I am confused about you recommending a calcium supplement that contains strontium. I have done a lot of research and have decided not to take it, and I thought that was what you had advised too. Have you changed your mind about it? Thanks. Most of the algae-based calcium supplements do contain a small amount of strontium that is actually part of the algae, but that’s ok. 🙂 We have a small amount of strontium circulating in our blood (around 350 mg), and the amounts in most algae-based calcium formulas won’t make a difference. What I do not recommend is a separate, additional strontium supplement. The New Chapter product has 5 mg of strontium. As a comparison, AlgaeCal’s Strontium Boost contains a little more than 600 mg, which is too much. I have been taking Garden of Life Vitamin Code Raw Calcium for several years. Is it ok to continue? You commented not to touch cash register receipts. Why? You did not explain. Is it the ink? Think of the reams of receipts we receive from grocery and drug stores! THINK, PARTICULARLY, ABOUT THE EMPLOYEES. How can they be warned, or the problem solved? HELP all of us. Thank you for the information, but what is safe now-a-days? I just bought a few new plastic containers. I am looking at one and it has no number at the bottom or on top. What else do we need to look for? This is getting ridiculous, what can we trust then? Our lives are becoming more hectic and we try to find anything that saves us time and money. We find it, then we hear it is not health. This is confusing. I don’t take a multi vitamin because of all the synthetic vitamin A in it. Synthetic A is a known Vitamin D blocker. They put astounding amounts of A in some multi’s. There is a lot of A in veggies so taking an unnatural type in pill form is senseless and could cause hip problems. Eating foods rich in A is handled very well by our body. Taking a synthetic form of A and we get into trouble. Lately I’ve been on a more and more healthy diet and I hear from more of the supporters of the healthy life style that it is not good to take single vitamins (as you mentioned about the A) as they create and imbalance. I am reluctant, but try to research how much I need and where I can get in in a whole natural way. We have a Farmers’ Market and CSA here. It helps to keep costs down of eating whole, local, organic foods. You are right in letting go of commercial vitamins. I realize that is not completely in keeping with Vivian’s program, but she is pretty natural too. I have been drinking distilled water for quite some time based on your recommendations. Much research is indicating that distilled water will leach minerals from bones. Please comment. Vivian, I have been taking AlgeaCal calcium supplements which you recommended a couple of year ago. Are you now recommending this new supplément TrueOsteo instead? I too have been taking AlgaeCal for a few years & I also want to know if I should stop that & order the TrueOsteo instead? Thanks for your input…………. Denise and Paula, there’s no need to switch to TrueOsteo unless you would like to. 🙂 As long as you are happy with AlgaeCal, you don’t need to switch. Of course, you’re welcome to try TrueOsteo for a change of pace, and you may find that you prefer it! Thanks for the info on BPA which most of us now know, but Mainly about BPS which I didn’t know so much about. I rechecked your calcium rich food sources and figs wasn’t there which I thought was a calcium source. Will check online to confirm. Regarding TrueOsteo, how many pills are in each bottle and is one taken each day? Do you have any guidance also for an all around multi vitamin? I take the calcuim you suggested which is the Tru Osteo. Hi Kathy! I take Women’s 50+ Formula, which you can check out here: http://www.gardenoflife.com/Formulas/MultivitaminFormulas/Women/tabid/1312/Default.aspx. All is well here and hope the same with you. Thought this article on calcium and its absorption would be of interest to you and also this newly confirmed contaminant in our environment called BPA. (whatever that might be!) read on…in the article. We are all fine and ticking…Ballie and Hannah are getting more and more conscious of what is going on around them and becoming expressive in their facial communication. Jonna has one arched eyebrow that comes on and off when he is disturbed. Will send you pics…just coming out of the weekend confinement with the two!! Love, Dad.